Summer Pasta Salad with Lemon-Tahini dressing! If you like Goddess salad dressing, you will love this salad! 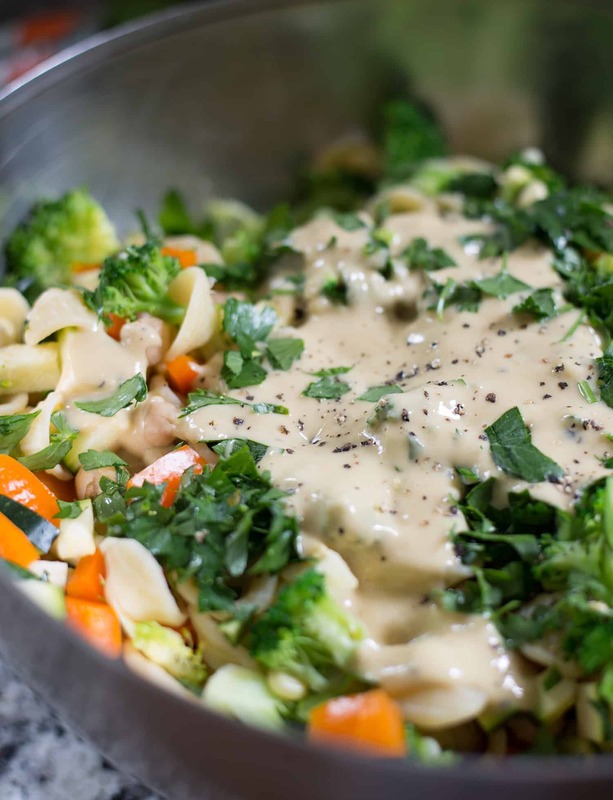 Noodles, four vegetables, tahini dressing, parsley and basil. Pasta salad! Just in case you needed more reasons to fire up the grill, invite friends over and cookout. Now that our summer travel season has almost slowed down, I’m looking forward to the best part of the season: doing nothing. BL and I are kinda late to the game when it comes to figuring out how to enjoy summer best. For the past few years, we’ve packed our weekends with short trips and bookended those with a week here and there. While it’s a fun few months, it also leaves us completely exhausted and overextended. I’m looking forward to the next month of blissful laziness; Friday afternoons at the park, sleeping in, and leisurely Sunday walks to grab coffee. Also, lots and lots of cookouts. One of my favorite things about our new house is the porch. Mostly in the fact that we’ve never really had a true porch before. Previous condo living hasn’t exactly offered that. But, now we have it! And I never want to leave. We’ve strung up lights, plotted down furniture and turned our backyard into a mini, humidity-filled oasis that I never want to leave. It’s also the perfect backdrop for impromptu gatherings, for which this pasta salad is perfect for. I was inspired by one of my favorite salad dressings, Annie’s Goddess Dressing. My god. That stuff is so incredible, I would eat almost anything slathered in it. Including pasta! And lots of fresh vegetables. This one is techincally a giant pasta and vegetable salad covered with Goddess dressing. Are you with me yet? 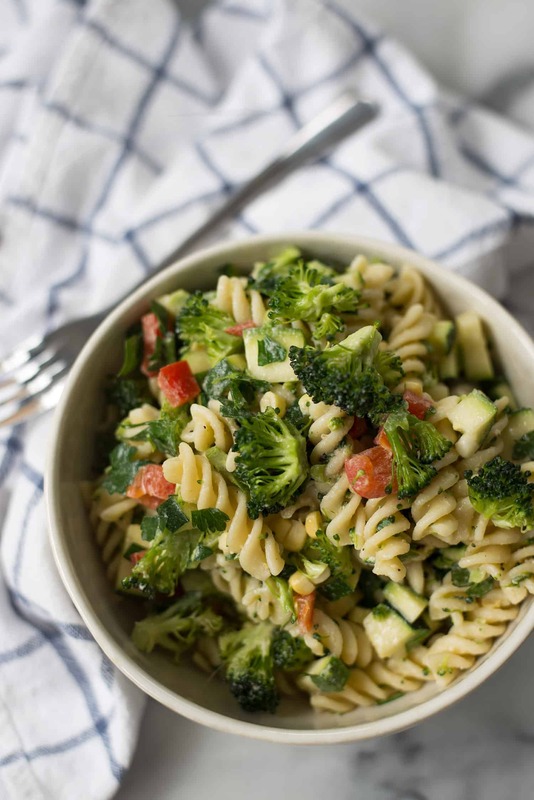 The best part is that while you get to enjoy the comfort of a pasta salad, it’s fairly nutrient dense– packing in almost 8 cups of vegetables into the finished dish! Which, if you haven’t guessed by now, is my favorite way to eat pasta. Finish it off with lots of fresh herbs (because, summer) and you’re set! Cheers to the weekend. Summer Pasta Salad with Lemon-Tahini dressing! If you like Goddess salad dressing, you will love this salad! Noodles, four vegetables, tahini dressing, parsley and basil. Vegan. Bring a large pot of water to a boil. Add the pasta and cook until al dente according to package directions. Using a large slotted spoon, scoop out the cook pasta and place in a colander. Rinse under cold water and set aside. Prep an ice bath by placing ice cubes and water into a large bowl. 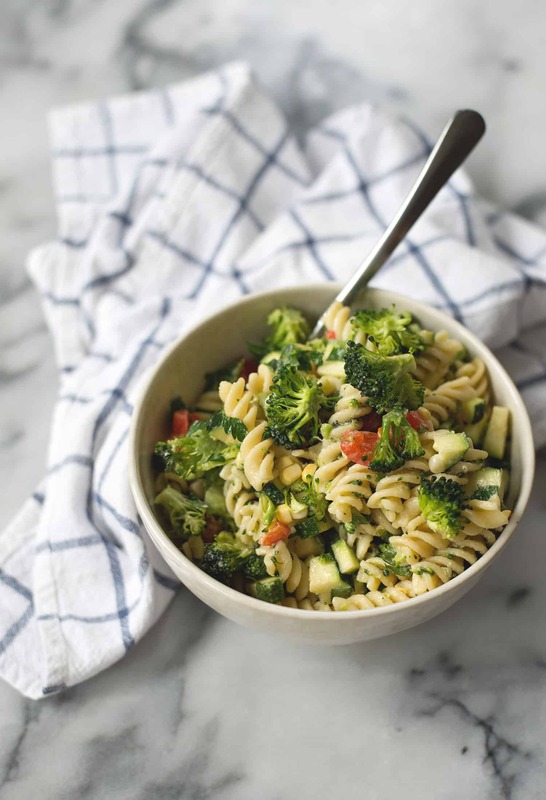 With the same pot of water as the pasta was cooking in, add the broccoli and zucchini and cook for 1-2 minutes until bright green. Transfer the vegetables immediately into the ice bath bowl and let sit until cool to the touch. Drain in the same colander as the pasta. Prep the rest of the vegetables: chop the pepper and remove the kernels from the cob of the corn with a knife. Since sweet corn is in season right now and so tender, I call for it raw. If your corn is more mature, then feel free to steam it before removing the kernels. Place all of the vegetables and cooked pasta into a large bowl. 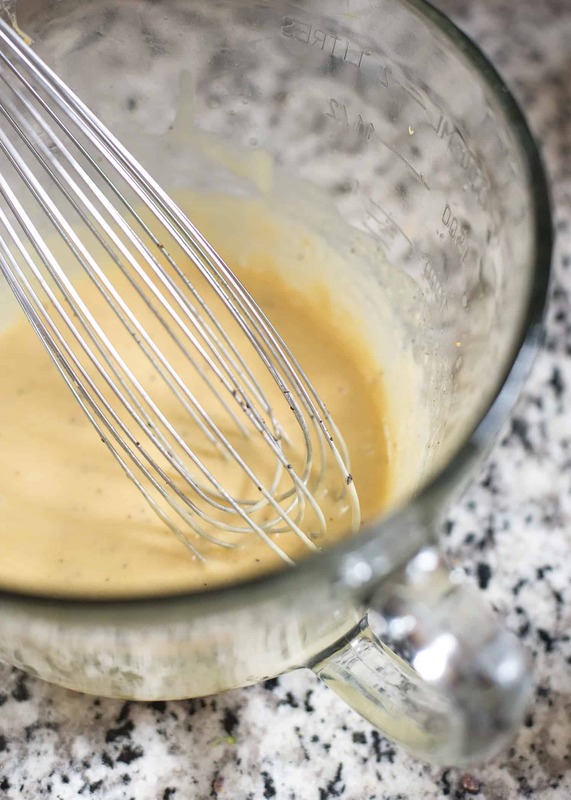 Make the dressing: whisk together the tahini, lemon juice, mustard, garlic, maple syrup, salt and pepper together. Slowly whisk in the olive oil and continue to whisk until very smooth. The tahini may break before it starts to become smooth, and that’s OK. Keep whisking. If the dressing it too thick, add a tablespoon or two of hot water to thin it out. Pour dressing over the salad and toss together. Stir in fresh herbs and serve. Yes! 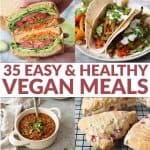 My favorite pasta salads are the ones that are jam packed with veggies and I love the variety you have here! And I cannot resist a tahini-based dressing so clearly I need this in my life 😉 Pinned! Thanks Kathryn! Me either- tahini dressings are my favorite! 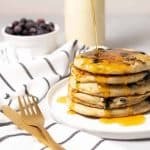 Such a simple ingredient list that’s full of big flavors! And I love that it’s packed with veggies!